What are the best software to view/read XML files in 2019? XML (Extensible Markup Language) files do not do anything on their own, and instead, they are just a way of storing data that can be easily read by other software. There are a lot of programs that use XML to store information. In other words, you can open, create and edit an XML file in any text editor. XML files are similar to HTML files but they’re not the same, XML is used for carrying data while HTML is used for displaying it. 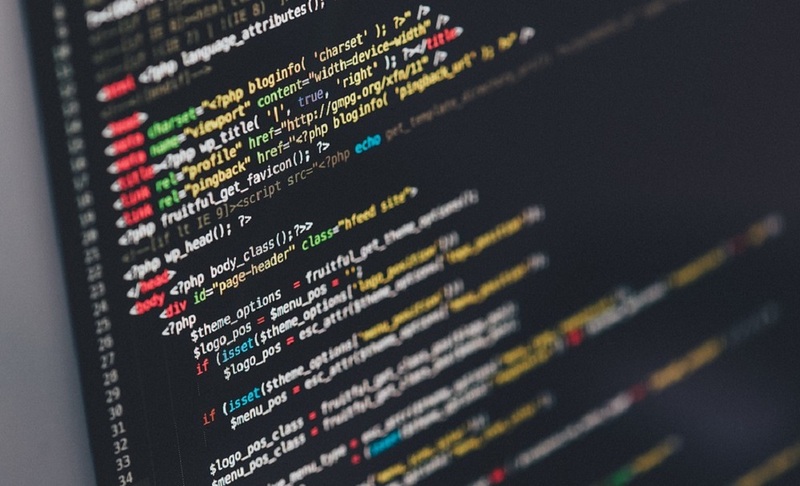 There are a few programs that are able to read and edit XML files, and we chose five of the best. Take a look at their sets of features to see which one is the best for your needs. This is probably the best program you can find in order to open a different type of files. The program opens over 300 file formats, including all .xml related files like .xlsx, .xltx, .xltm and .xsd. 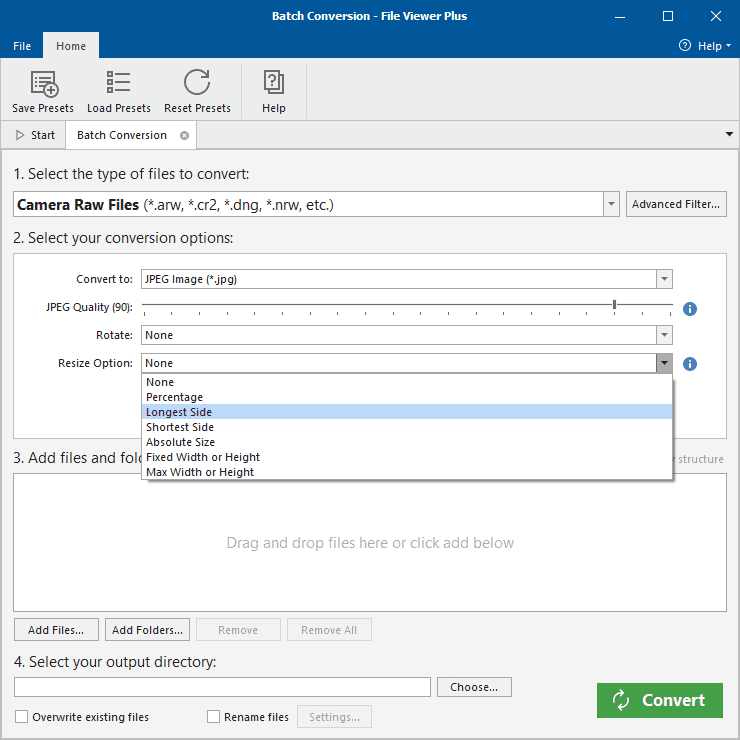 File Viewer Plus 3 will not only let you open various file types but will also allow you to analyze and edit some of them (the most popular). These are just a few of the features that File Viewer Plus 3 offer to its users. Download it now and give it a try, you will not be disappointed. XML Explorer is another lightweight and fast utility that allows you to view XML files. The best thing about this software is that it is able to handle huge XML files. The program has been tested even on files that are over 300MB. XML Explorer allows users to enjoy fast exploration of data, copying of formatted XML information, evaluation of XPath expression and also XSD schema validation. 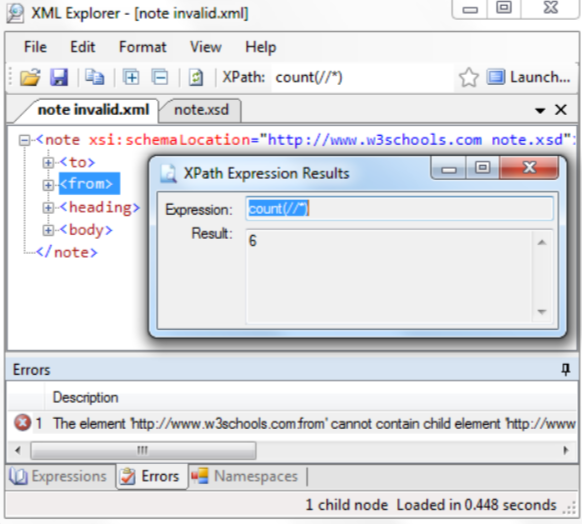 XML Explorer validates XML documents using XSD schema that is specified in the document. The program also shows a list of validation errors, and you will be able to navigate and select the node by double-clicking on the error. There is an expression library included in the program and this stores and manages commonly used XPath expressions; it’s similar to Bookmarks from Firefox. It supports various document tabs, and you can also middle-click to close those tabs. There are fully-featured Visual Studio-style dockable panes. XML Explorer does not support editing for now. The program uses a DockPanel Suite and a docking library for .NET Windows Forms development which mimics Visual Studio .NET. Overall this is a convenient tool, and you can find out more about its capabilities by downloading it to see how it works. You can download the archive of XML Explorer and start testing it. XML Notepad 2007 offers users a simple and really intuitive interface that will allow anyone to browse and edit XML documents. You will be able to find this extremely useful tool in the Microsoft Store. The Tree View is synchronized with Node Text View in order to provide quick editing of node names and values. The program uses incremental search in both text and tree views, and this means that as you type, it will navigate to matching nodes. 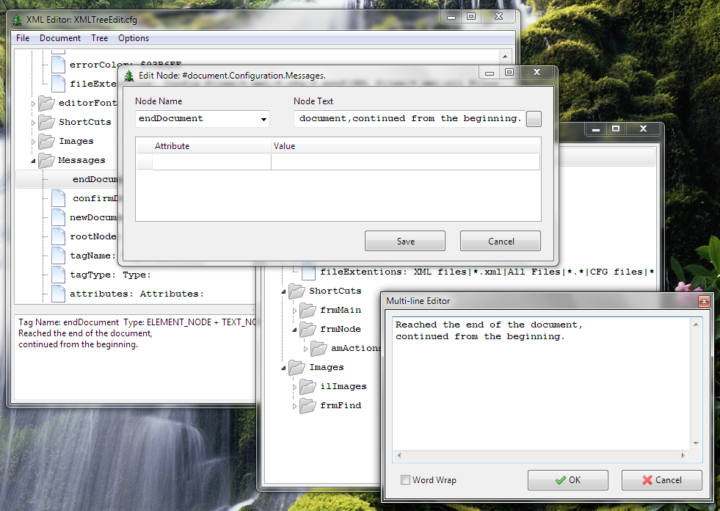 XML Notepad supports cut/copy/paste functionalities. The program supports drag/drop which allows easier manipulation of the tree even from the file system and across various instances of XML Notepad. There is an infinite undo/redo for all edit operations. You will also get the opportunity to edit large text node values. There are configurable fonts and colors via the options dialog, and there’s also a full find/replace dialog that offers support for XPath and regex. With the help of XML Notepad, you will enjoy excellent performance even on large XML documents and this software is able to load a 3MB document in just one second. You will get instant XML schema validation while you are editing and errors and warnings will be shown in the error list window. XML Notepad supports custom editors for date, dateTime and time datatypes. There is also included an HTML viewer that is able to process XML-stylesheet processing instructions. To find out more information about XML Notepad we recommend that you visit the Microsoft Store and click on the download button to start downloading this tool. EditiX XML Editor is another high-Quality generated XML editor and XSLT editor that is compatible with Windows and other operating systems. This tool is designed to help web authors and application programmers to take advantage of the latest XML and XML-related technologies such as XSLT/FO, DocBook, and XSD Schema. 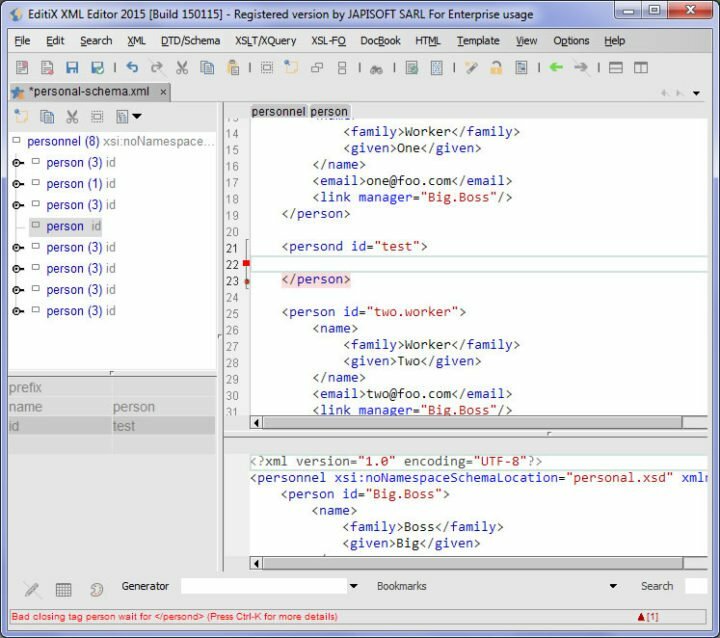 EditiX XML Editor offers users an extensive range of XML functionalities within a refined IDE that is able to guide users with intelligent entry helpers, and this means that even beginners can easily get the hang of how this tool works. The program comes with real-time XPath location and syntax error detection. The helpers are also provided with context syntax popup supporting DTD, RelaxNG, and Schema. EditiX XML Editor comes with support for various templates and project management. You will be able to apply XSLT or FO Transformation, and the result will be shown in a dedicated view. All the process will be manageable via shortcuts and working locally can be managed by OASIS XML Catalogs. This piece of software will turn out ideal especially for web authors, app makers, and programmers. You can download EditiX XML Editor from its official website, and you can also navigate in order to find out more details on this tool just to see if it matches your preferences. 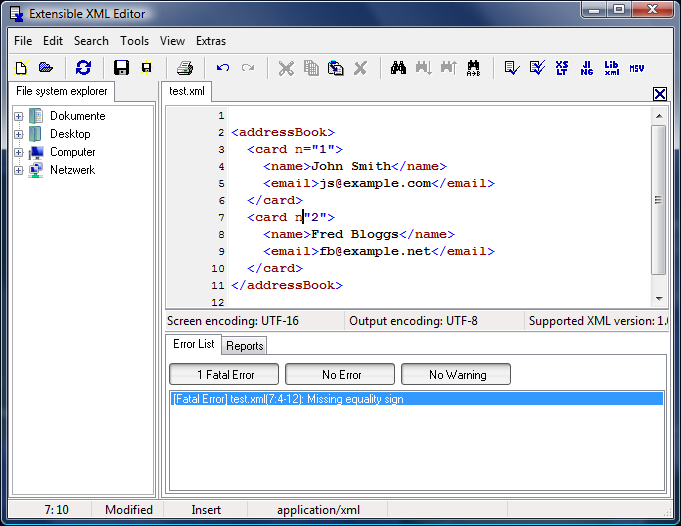 Essential XML Editor is a lightweight program for the text-based XML document editing. There are enough key features included in this editor to provide users with everything they need. Earlier versions of this editor have been released under the name Open XML Editor. But now, it’s required to purchase an activation key to use all the features that come packed in this tool, and that’s why the term “open” was not considered appropriate anymore. There is a built-in XML well-formedness tester included alongside a DTD Validator and a plug-in for the Saxon XSLT processor. The Essential XML Editor also includes some more advanced features such as plug-ins for third-party Relax NG and W3C XML Schema validators. Other features that are supported by this software include undo/redo, search and replace, shortcuts for every command, a built-in file system explorer, a submenu of recently opened files and more. There is also a detailed page setup and print preview dialogs. The program also comes with an external hex editor that can be customized according to the users’ preferences. The key features of this editor can be used for free as a trial version, and there will be no time limit for this. In order to use the more advanced features, there is a small fee that you will have to pay. You can download Essential XML Editor from its official webpage and give it a try. SourceForge’s XML Tree Editor is able to display XML files as tree views, and the software also allows essential operations including adding, editing and even deleting text nodes along with their attributes. The primary target of this software is to provide a user-friendly tool to create and edit XML configuration files for users who don’t necessarily know too much about XML. The software comes with a built-in Free Pascal Lazarus that allows really easy compilations for various target platforms. The available commands for comments include add, delete and edit. The text node is not separated from its container tag, and it can contain virtually anything. The program is very customizable, and it comes with two XML configuration files. The search facilities that this software has to offer include searching through text values. XML Tree Editor supports language translation and the only tool necessary to make a new translation is the program itself. The commands that are available for XML tags include the following: Add, Edit, Delete, Rename, Move to another position on the tree, Copy to another location, Copy from a separate reference XML document. This program represents the ideal way to move and edit XML nodes effortlessly and without wasting time. Some users say that this tool is quite similar to Notepad++. You can check out more features and functionalities packed in XML Tree Editor by heading over to its official website of SourceForge. These are the five programs that allow you to read/edit XML files. We recommend that you head over to their official websites to check out as many details about them as possible before making your final decision. Editor’s Note: This post was originally published in February 2018 and has been since revamped and updated with new products so our users would have a wider range of alternatives.